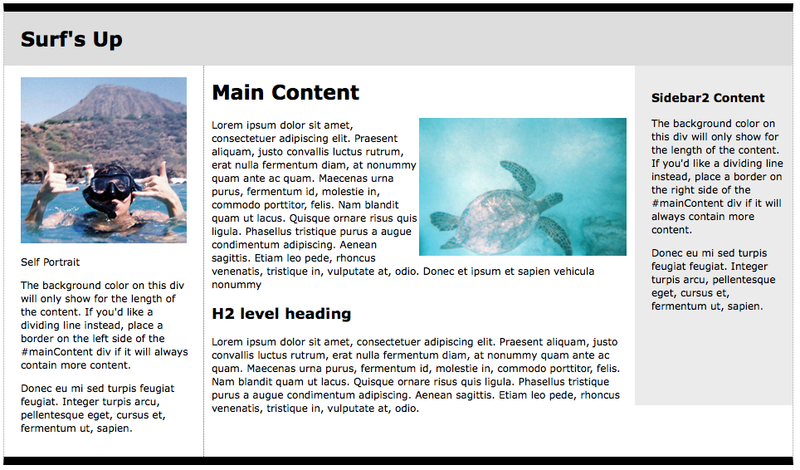 For this workshop, we will recreate a simple web page using CSS style sheets. At first, this will seem like a complex process because unlike print design, web design requires that code be written to correspond with the aesthetic structure you wish to create. But this is, in part, the beauty of a program like Dreamweaver. This program allows you to build the design of your web page so that you can see it as you go. And for the most part, Dreamweaver does the coding for you. So, instead of having to write a bunch of HTML coding to realize your design, you can design and let Dreamweaver write the code for you. To get started, download the .zip file below. In it, you will find three files: Dreamweaver_Workshop.pdf, begin.html and end.html. Follow the instructions for creating a page that looks like the one shown here.